President Trump taking on jihad and Jew-hatred, while the Democrats are aligned with the jihad force. President Donald Trump turned up the pressure on Democratic Rep. Ilhan Omar Tuesday, demanding the first-term lawmaker resign over her Twitter comments that many of her own colleagues called anti-Semitic. 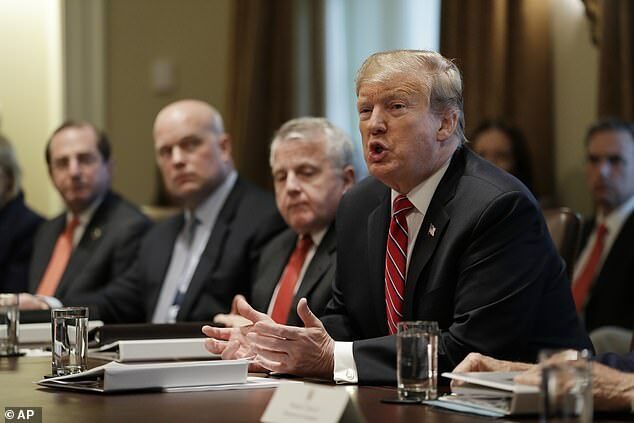 ‘I think she should either resign from congress or she should certainly resign from the House Foreign Affairs Committee,’ Trump said – stoking a controversy that prompted senior Democrats and party leaders blasting Omar’s comments about Israel. One of the tweets that drew criticism was her one word tweet: ‘AIPAC!’ which referenced the powerful American Israel PAC. She also tweeted ‘all about the Benjamins’ – in comments colleagues said made it seem Israel supporters adopted their positions for cash. Trump also weighed in on the controversy swirling around Rep. Ilhan Omar Monday night, saying the first-term lawmaker ‘should be ashamed of herself’ for her ‘all about the Benjamins’ comment. ‘I think she should be ashamed of herself. I think it was a terrible statement. And I don’t think her apology was adequate, the president told reporters aboard Air Force Once en route to a Texas campaign rally. Trump spoke hours after the lawmaker apologized facing a flood of criticism, following a flood of criticism from both Republicans and Democrats in Congress, including House Speaker Nancy Pelosi. Asked what Ilhan should she say, Trump responded: ‘She knows what to say,’ without commenting further. It was the only part of a discussion with reporters the White House allowed on record – reflecting the political potency of the clash and Trump’s desire to weigh in. Omar, a Minnesota Democrat, apologized for using old anti-Semitic tropes about Jews and money in recent tweets – a move that comes after a phone call with Speaker Nancy Pelosi and a statement from the entire party leadership team blasting the freshman lawmaker. ‘Anti-Semitism is real and I am grateful for Jewish allies and colleagues who are educating me on the painful history of anti-Semitic tropes,’ Omar said in a statement Monday afternoon. Omar, however, stuck to her guns in blasting the problems of lobbyists and their financial influence in politics. Pelosi and her entire leadership team issued a blistering statement after Omar, in her first months in office, penned successive tweets on matter. ‘Anti-Semitism must be called out, confronted and condemned whenever it is encountered, without exception,’ Pelosi and her team wrote.